This mission resonated deep within side me and propelled me to seek an ambassadorship with Legend. 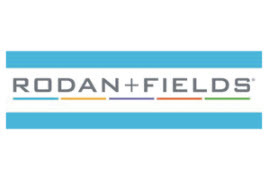 They continue to strive to provide the highest quality sports compression socks, leg sleeves and clothing so you can perform better and recover faster. So with that being said, I said yes when the offer came through and will proudly be representing Legend for 2017! Excited to say the least as I know my legs will remain fresh and healthy through this journey. Now on to the gear that I stand fully behind and trust my legs in, right? 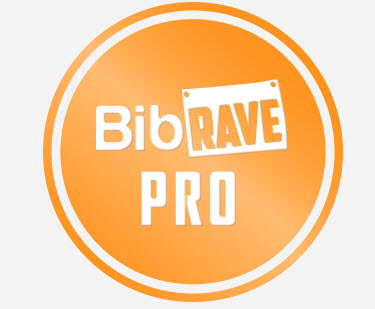 In this blog I will spotlight the two pieces of gear that I use most during my workouts that are mostly running. 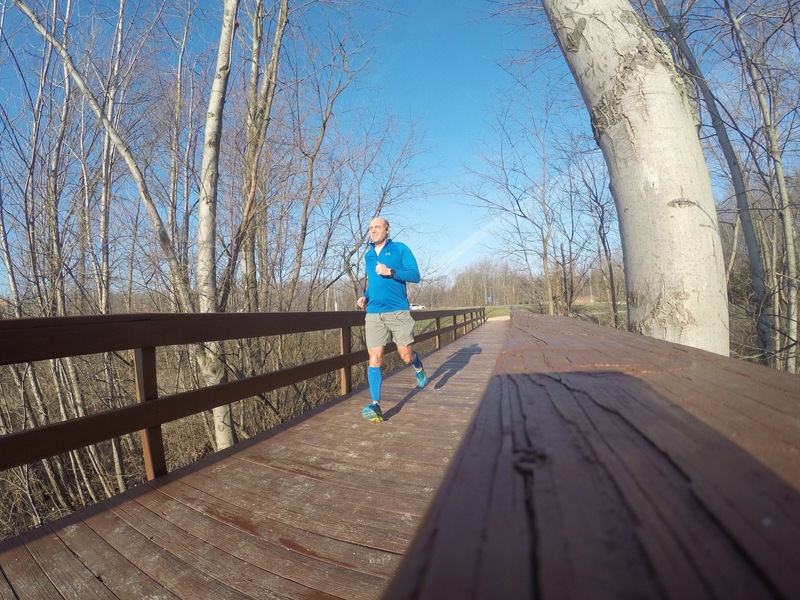 When I first started running I had no idea about compression performance socks or gear for that matter, not to mention what it was used for. As I began upping my mileage my legs began to feel heavy and lethargic, which was not a good thing. So I ventured into the compression gear after talking with a few runners. I received several recommendations, in which I tried several (to remain nameless), and just didn’t see the benefit. I mentioned earlier that that felt as my circulation was being cutoff, tingling sensation, or just were way to loose and were fashionable tube socks. Finally a good running friend was wearing Legend and that is when my love relationship started. So once these arrived, I immediately ripped open the package and examined the quality. The colors just popped and the branding was across the top. Plain and simple right? My next thought was, “will I have to fight to get these socks on?” Surprisingly if you follow the instructions provided, these socks slip on quite easily. What surprised me the most was how I could actually feel the Achilles and arch support, support that I have so dearly searched for. 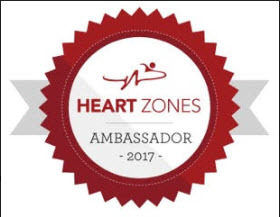 The accolades continued throughout my run, as I felt greater endurance from the compression, which provided for a easier run. I have also ventured out in 35 degree weather with these on and my legs have actually felt very comfortable, where other parts of my body were cold. My overall impression of these Performance socks would be 4.5 out of 5, and the 0.5 is not based on quality, but lack of additional colors. 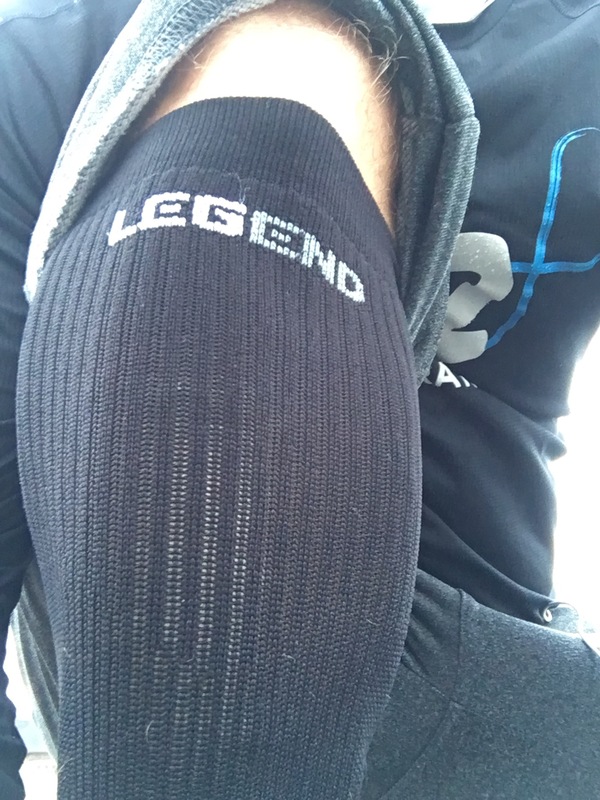 I also purchased a few pairs of the Legend Compression Leg Sleeves to try out. The only difference between the performance socks and leg sleeves, is the lack of a covering for the foot. These easily pair with you favorite running socks, and for those that do not like a full compression from the tips of the toes to the upper calf muscle. 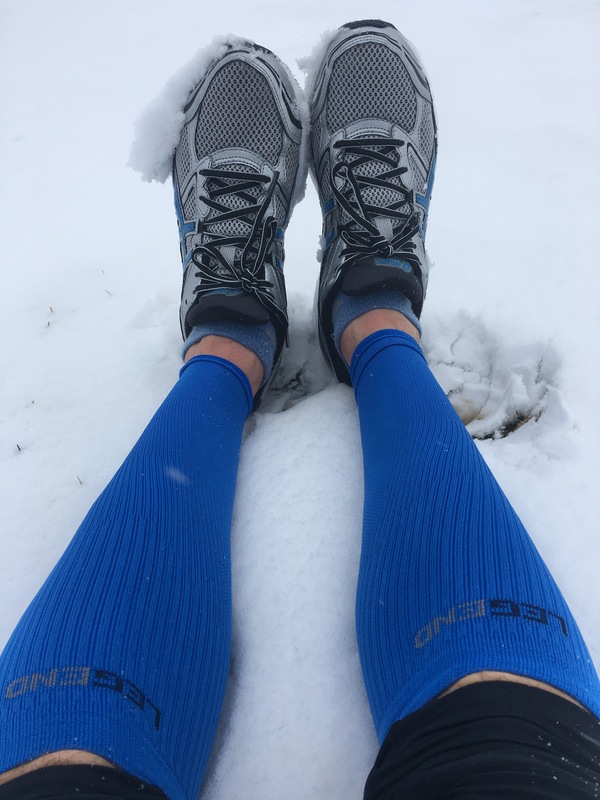 The leg sleeves provide all the same benefits and the performance socks. I mainly wear the leg sleeves on my short runs where I am not looking for added arch support and they do the trick. Another great feature is I will where them around on my recovery days to get the blood circulating. Same overall impression of the leg sleeve as I did with the Performance sock. 4.5 out of 5. 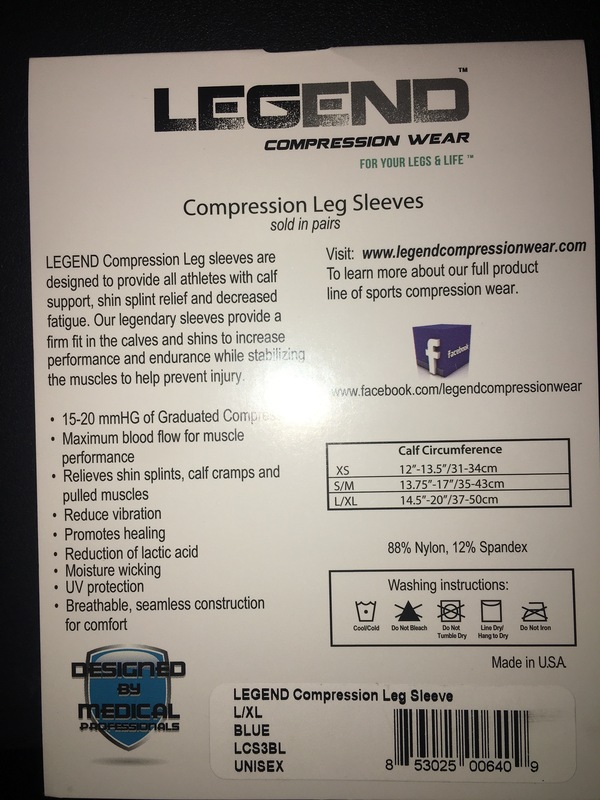 Remember if you are looking to try out a new performance socks Legend Compression Wear may keep you from looking any further. Follow along at the various social media outlets for discounts and giveaways. Thanks for the review. I’m currently looking into compression sleeves since my miles will start to ramp up next month. I’ll definitely have to keep these in mind. Awesome good luck and let me know if you have any questions. Definitely my favorite brand out of the few I’ve tried.